I have been volunteering at the SPA for over four years now, and I thought I had seen and heard just about everything. But today I truly feel stunned and amazed. And very happy. 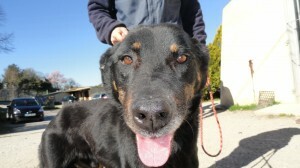 On 26th February the SPA welcomed four dogs whose owner had died. All of them were small and varied in age from 2 to 12 years. All but one of them is identified in the name of the recently deceased owner. 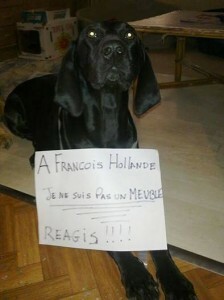 So as is customary, we sent a letter to the owner of the fourth dog to the address on the database in Paris. And guess what? 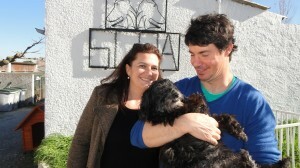 The owners came to collect Charly today. They live in the Herault and their dog had disappeared from their garden there almost eight years ago. Yes, you read that right. EIGHT YEARS! They just couldn’t believe the news (or their luck) and after several phone calls back and forth (checking tattoo numbers, exchanging photos and descriptions), they hastened to Carcassonne to collect Charly. I am not usually at the SPA on a Friday, but I couldn’t resist, and it was one of the most wonderful things I have seen there: Charly recognised them!!! I guess we will never ever know how Charly came to be living with the woman in Carcassonne. He is 10 years old and has been missing since he was two and a half! I cannot imagine the emotions of either Charly or his owners. I think of all those people who are still looking for their dogs years after they went missing, and those who have given up hope and are no longer looking. And how they would feel if a letter arrived to tell them that their long-lost friend was at a refuge. I was a bit teary, to be honest. But I was not the only one! Yet again the benefits of identification are clear! Even if it took eight years for Charly to be found. 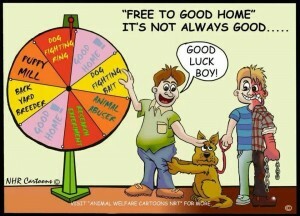 In fact usually a vet will check a dog’s identification on the first visit. 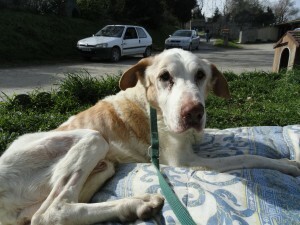 And Charly had been well-looked after, there is no doubt. He has even been castrated during his “missing years”. We have no idea why his tattoo was not checked, but the main thing is that Charly is back at home and is, as we speak, getting reacquainted with his family. This includes a young master (who was a toddler when Charley disappeared) and two doggy friends, one of whom Charly knows from before! The couple have promised to send us photos and I for one cannot wait! If you find a dog, please give his owners a chance to find him. Ask a vet to check to see if he is chipped or tattooed, even if you would like to keep him for yourself. 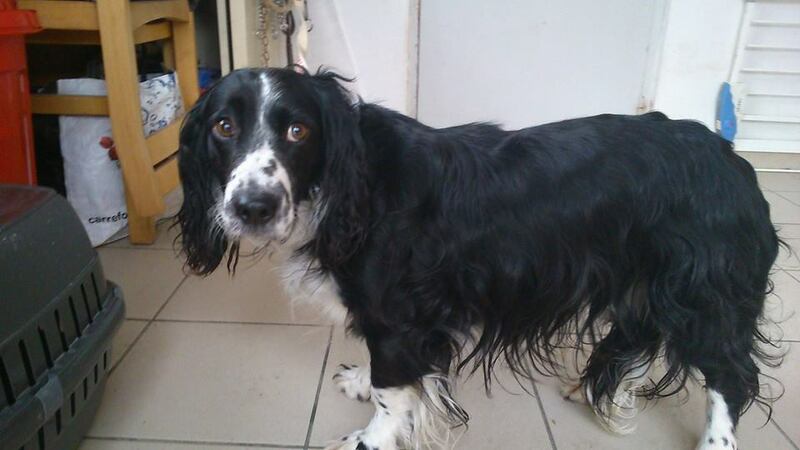 Imagine how YOU would feel if your dog was lost and you had no news of him. 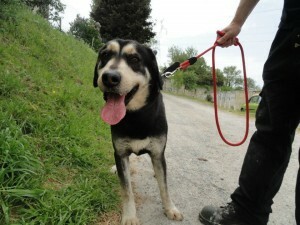 Other refuge news can wait till tomorrow; today is Charly’s day! Charly. Nine days at the SPA, but missing for eight years before that! 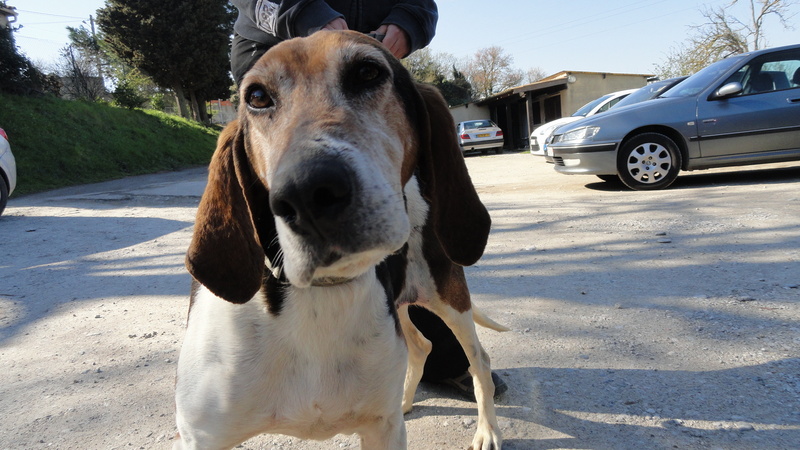 Today a lady drove all the way from Arachon, a round trip of some seven hours, to collect her two dogs from the SPA. There is a lesson here. This lady lived in a nearby village until very recently. When she moved away to nurse her ailing father, she gave away her dogs “free to a good home”. 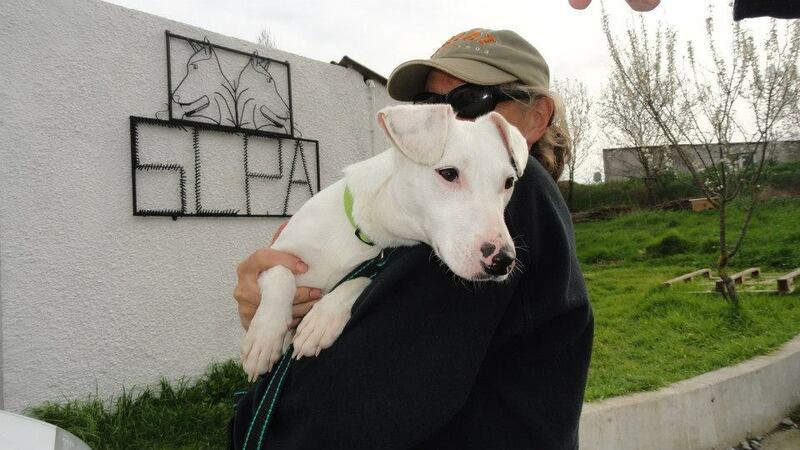 Having spoken to her, it appears that the first of the dogs, Bonnet Red, arrived at the SPA the very day he was given away, and his friend, Chispa, was found in the external boxes on Monday. The dogs were not identified, (incidentally it is illegal to give away or sell unidentified dogs), so we had no way of contacting the original owner. And no way of knowing that she wanted her dogs. 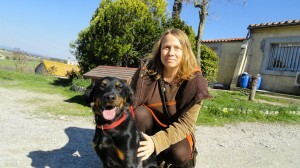 But her daughter saw the dogs on the SPA Facebook page, and an emergency trip to Carcassonne was made! 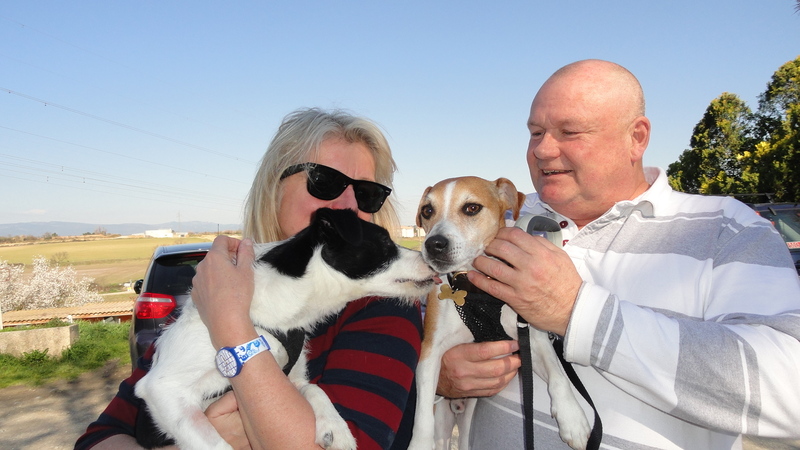 When she arrived to collect them, she found a third dog, who had supposedly been rehomed earlier. All three have now left and are identified. 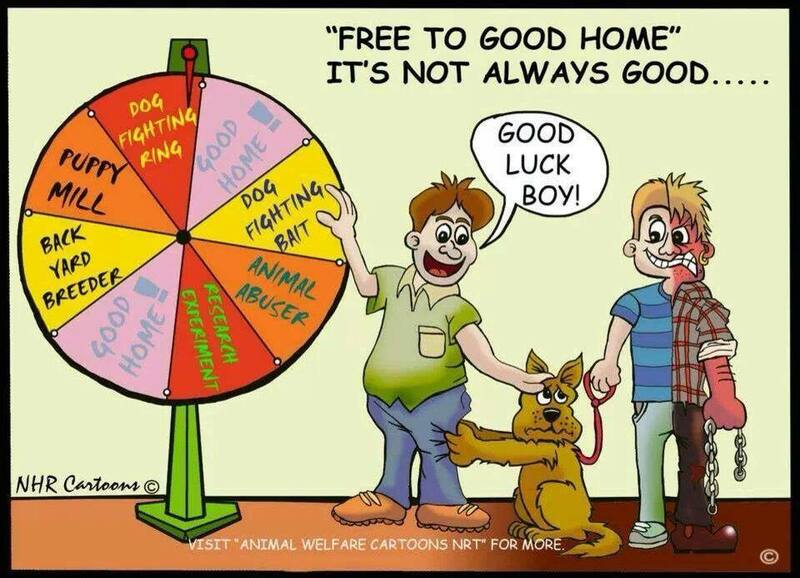 How many times do we have to say it, Free to a good home is a bit of a lottery for the dog. These dogs were lucky that their original came to collect them, but there are doubtless many more “rehomed” dogs in refuges throughout France, with their original owners unaware of their plight. In other refuge news, we had two new arrivals, another puppy (a black male shepherd cross) and lovely Ginger, who is bound to have an owner, but will they reclaim her before someone else snaps her up? The clock is ticking and Ginger is not identified…. Okay, money is exchanging hands and beers are being bought to settle bets. 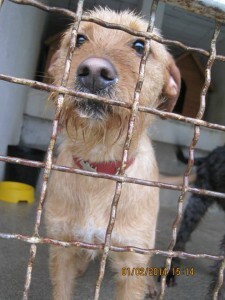 Last night Moira told us that of the five dogs who left for the UK, the first to be reserved is …. (wait for it)… HOOD! 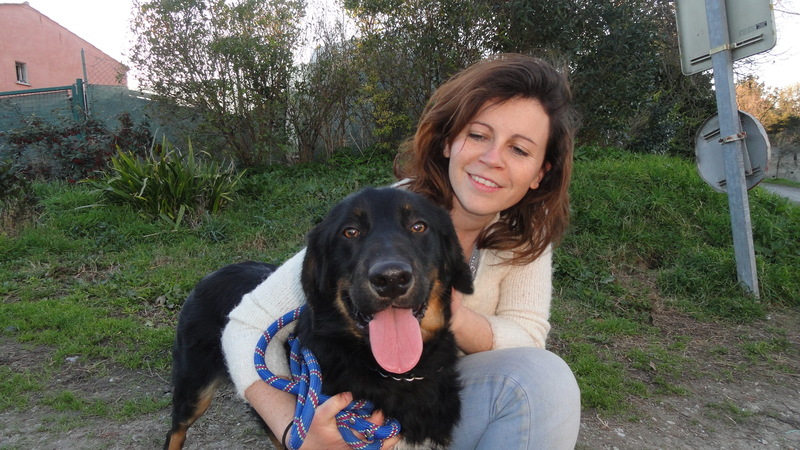 Yes, just one week after he arrived, this fabulous dog has found his new family! So that answers the question as to who will be the first to leave. I was going to see if we should take bets on who would be next, but it appears that as soon as one of the SPA Carcassonne dogs is available for adoption (following castration and evaluation of behaviour) he is reserved. 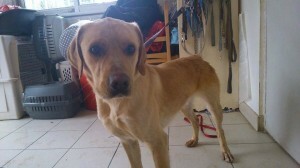 I say this because today Galileo was put up for adoption and he, too, was reserved immediately! 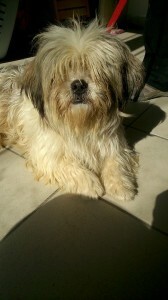 So NOW will you believe us when we say that the SPA Carcassonne has the best dogs in the world?! Despite some nasty-looking clouds, the rain held off this afternoon, and volunteers tried to walk the dogs who had not been walked this weekend. We welcomed a newbie, Sylvie, to our team, as well, and she soon found her feet thanks to Anoushka who showed her the ropes. 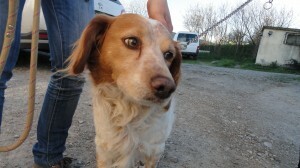 Of the five dogs who arrived (sigh), four were identified. 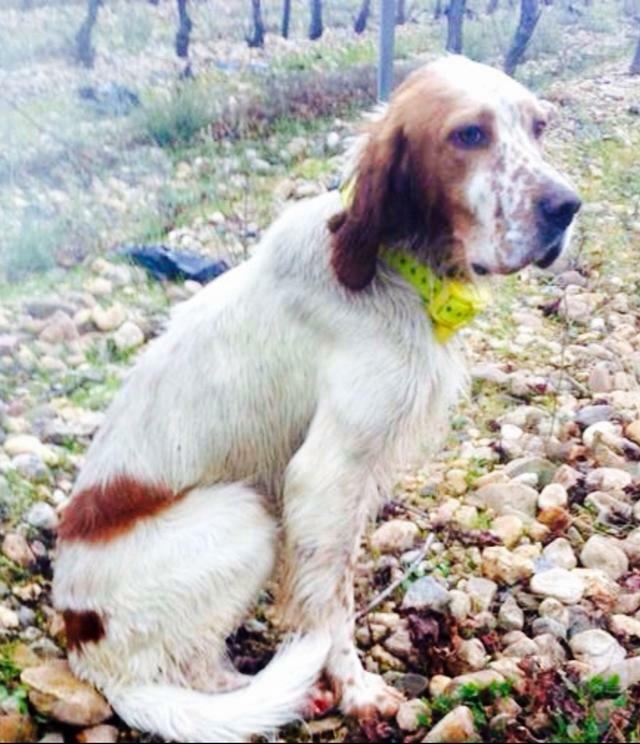 The owners of Tommy had already contacted us on Facebook to tell us he was missing, which is always a good sign. The two spaniels should leave tomorrow. Not sure about the border collie. He is clean and appears to be well cared for until you feel how thin he is. The non-identified dogs, a puppy, has been named “Pigeon”, for reasons that will be obvious if you are familiar with the French expression “to treat someone like a pigeon”. 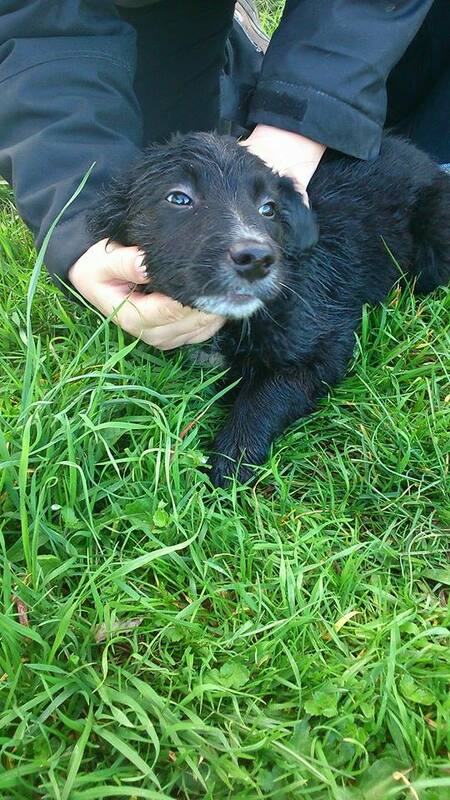 The people who abandoned this puppy seriously thought we would believe their bizarre tale about how they found him. We were not born yesterday. I just hope the novelty of the other Christmas presents they got last a bit longer. The refuge is very full……..
First news of the day is that the five dogs arrived safely in the UK. As Moira said in her message to me, it was very impressive, how, despite the fact that they arrived several hours ahead of schedule and well before the place opened, night security staff were there to welcome the dogs and make them comfortable, even though we had no way of warning them of the change of arrival time. Those five dogs are in good hands, believe me! Back at the SPA, today saw the sad return of Dusty. 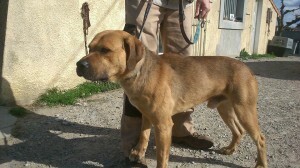 Like Tayson, that is the fourth time he has been returned to the refuge and each time it is for the same reason. Listen, people, when we tell you that a dog is a runner and needs an enclosed garden, we mean it. Poor Dusty, back again, and probably wondering if he will ever find someone who loves him enough to keep him; someone who already has an enclosed garden or someone who is willing to raise the height of their fence to accommodate this lovely boy. I will go and see him tomorrow, and assuming his vaccinations have been kept up to date, will take him for a walk and try to reassure him that YES, we will find him the right home, one day. He was born in November 2010 and so there is still plenty of time for him. I hope. 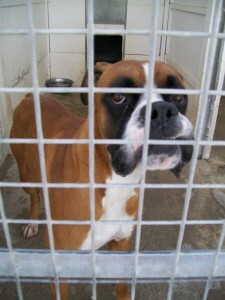 A beautiful boxer cross arrived too. We have called him Yemen, although of course we do not know his real name because, surprise surprise, he is not identified. Better news for Gem, whose owners had already contacted us to say that her IDENTIFIED dog was missing before he even arrived. Responsible ownership! Owner and dog were quickly reunited. I hope the same can be said for the other missing dog whose owner signalled our Facebook page. She is not identified. I hope she is found, but I hope that her owner learns a lesson and pays what is a relatively small amount for a microchip. What is wrong with people that they would rather put themselves through hours of worry and heartache, rather than just get their dogs identified? 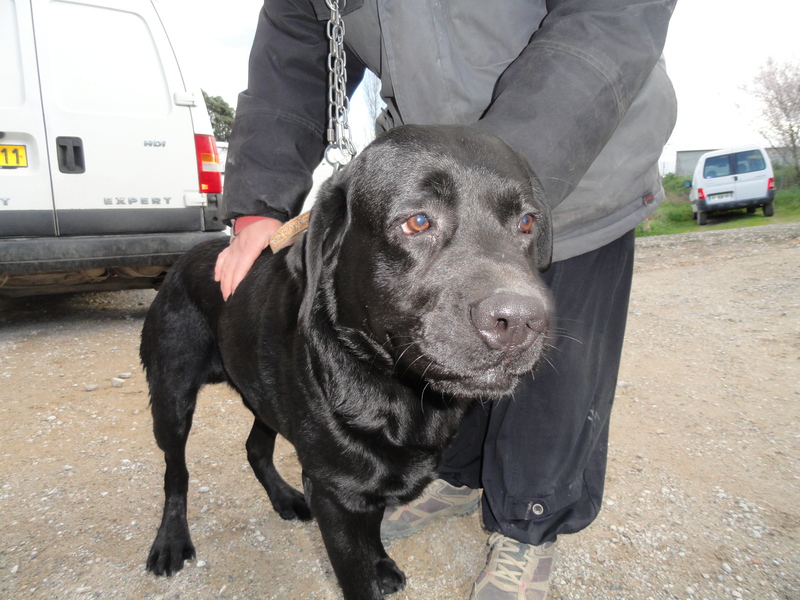 I know identification does not guarantee that your dog will be found, but it certainly increases the chances. Although this blog tries to put politics aside, we are definitely in favour of anything that can make animals’ lives better. So please, if you haven’t already done so, could you sign this petition and spread it far and wide. At present in France legally you can be either a person or a thing, meaning there is no difference in law between the rights of a piece of furniture and those of an animal. This needs to change, and the Foundation 30 Millions d’Amis is spearheading a campaign to introduce a third category, for living creatures other than humans. You can sign regardless of where you live. Please do so. Together we can make a difference! And Shaina (ex Pippa) would like you to sign the petition, please! So what could possibly happen on a Sunday when the refuge is not having its monthly open day? The departure of five more dogs, that is what! Of course you remember the appeal that we made for transportation fees for five lucky dogs who have been chosen to go to a fabulous association in the UK. Well, today was the day. Or perhaps better put last night was the night. Or was it morning? In any case, it was a time when most normal people are asleep. But we are not normal! At 03H00 Moira and I (plus husbands) and Dominique drove to the SPA to meet the dog transporters. We had all eaten together chez moi, and thanks to the wonders of modern technology, were able to live track the wagon as it made its way through Spain. Thus we were able to time our arrival at the SPA to meet them. All five dogs were loaded up, after papers and microchips had been checked, and we waved goodbye to Charley, Kiko, Galileo, Hood and Mix. We had already had news that all is going well, and with a three man team of drivers, the dogs will be walked every three hours until they arrive at their destination in South East England. I would like to thank Moira particularly for all her organisation, including visiting the association to chat to them about our dogs and to make sure they had the same basic principles as us (ie no euthanasia and (something that we would love to provide but are unable to), luxury living quarters). Also to Moira (again), Dominique, Viv and Roy for getting up so early (or staying up so late in the case of the guys!). Thanks also to Carole and the SPA employees for making sure all the paperwork was sorted out, and to yesterday’s volunteers, who made sure every dog got a nice long walk before moving to the top kennels to make it easy for us to load them up in the pitch dark this morning. I am so pleased for all the dogs. 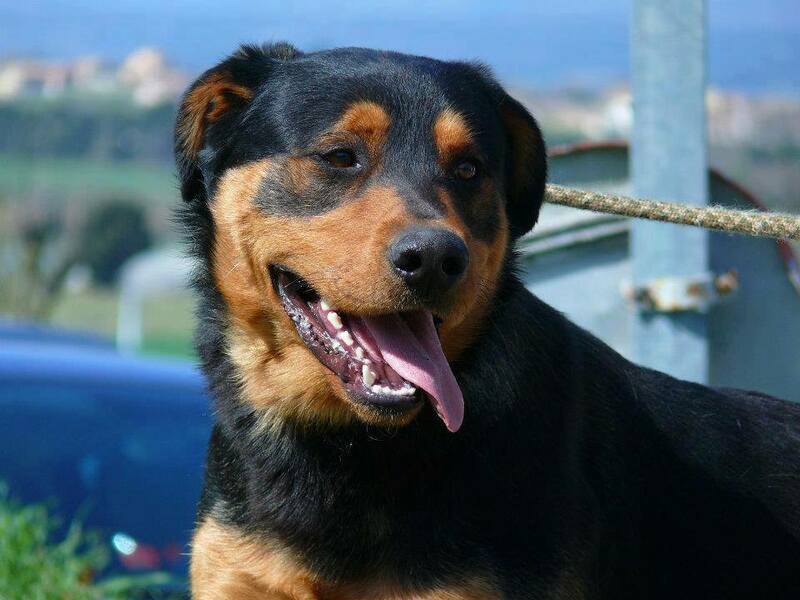 It is the opportunity of a lifetime for them, a new country and an association a bit like our great friends at Animal Trust; plenty of walks, house-training and obedience training and an average waiting period pre-adoption of just three weeks. I wonder who will be the first to leave…. Let us not forget that it was thanks to the recently departed Jim that we were given a route into this well respected association, and the adoption of each of them will be homage to this gentle man who loved animals so much. I am certain he would be delighted to know that all went well and thanks to him, five dogs are on their way to a better life. Thanks to everyone who donated towards the travel costs, too. You have been amazingly generous, as ever. 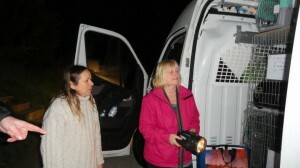 The appeal continues, by the way, as transporting the dogs was not cheap. However we wanted them to arrive safely and at a time that suited everyone. I can’t say we were happy about the middle of the night pick up, but in the overall scheme of things, it means little. Early bed for me tonight, though! Moira and Dominique have a final look at our lucky five, before wagons roll! Okay, I was a bit mean last night and left you all on the edge of your seats regarding today’s BIG adoption. So without further ado, the lucky boy was KAWA! 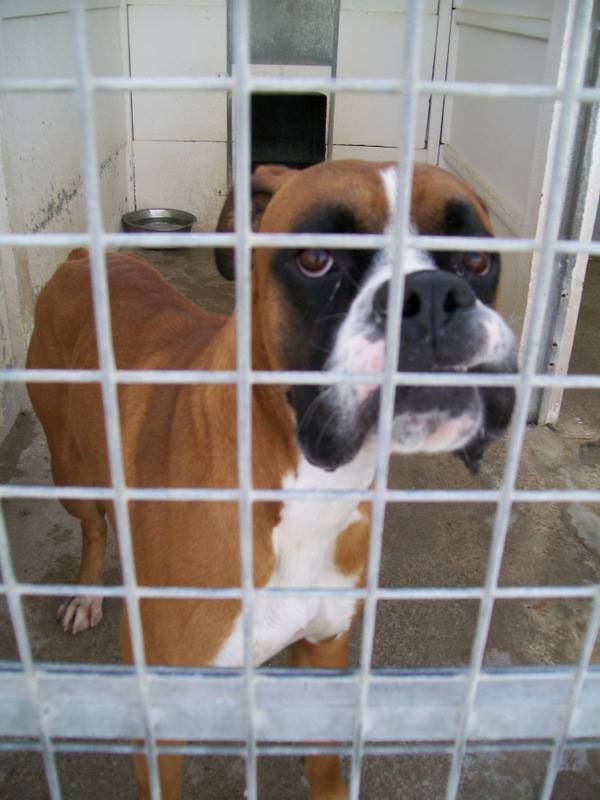 He has been with us for 17 months, and has seen several of his kennel mates find new homes. His current (or rather now “ex”) kennel mate was Axel, who arrived as a very bouncy overgrown and ill-mannered puppy, and although it is not something that every dog is capable of, Kawa has been patient and tolerant with him, put him in his place when required and generally made Axel a much nicer dog. But today was Kawa’s turn, and we wish him well. He was not the only dog to leave today. We had no fewer than five adoptions in total. Yes, five. It has been a while since I have been able to say that. Thanks to Doglinks, Blanca found a fabulous home. 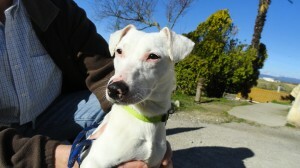 A couple of dog lovers saw an appeal for this deaf little girl and drove all the way from Rheims to collect her. It was love love love and the huge round trip was worthwhile. Lovely Georgette, who was abandoned a few weeks ago was adopted by a family who have had their eye on her ever since she arrived. They met her for the first time today, and the adoption was mutual. Happy smiles all round. Furio found a home, leaving both his sponsor, Audrey in tears, as well as Bond, who is alone yet again. Then the little puppy, Elena, whose brother Stefan left yesterday found a home of her own. So she didn’t have long to wait after all. As ever it was not all fun and games. Two new dogs arrived, a lovely beauceron called Pit who is identified, but whose owners are untraceable so far. And just before we closed a Brittany spaniel was brought in, supposedly having been found at the station. How many hunt dogs are found in the centre of town? In any case, this five year old boy has been named Bonnet Red in honour of his Breton roots and believe me he is far better off with us than he was before. So a good day and another one to come, I promise! Some good news and more to come! Yesterday’s arrival, Circa, was reunited with her owner today. As soon as her pictures were posted on Facebook, the owner contacted us, saying he had been looking for his dog everywhere. And he arrived at the refuge in double quick time to collect his beloved dog. 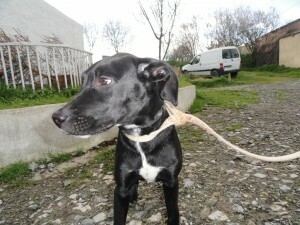 When Circa was brought in (by the authorities of the village) we were told that she had been wandering for days. Local elections are taking place in April and apparently the rounding up of stray dogs is seen as a vote winner. Thus proving that you don’t have to live in a dictatorship or in a city preparing for the Olympics to see examples of how dogs are used for political reasons. Okay, in Carcassonne it is not a question of massacring dogs, although for some SPAs that are overcrowded, it could certainly lead to the death of some animals. Today saw the adoption of little Stefan. He leaves behind his sister, Elena, who is the last of the Vampire Diaries litter. I hope her chance comes soon; I hate seeing puppies alone in their cages. 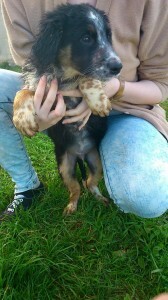 However now that she has had her second vaccination she can go and play with the other dogs! There has been so much bad news recently that when Carole told me about a reservation made today, I actually cried. This is not at all my style, it is more a habit of Dominique’s, but I am feeling particularly sensitive at the moment, so I “did a Domi”. Do you want to know who the lucky dog is? I BET you do!